First of all , I am giving honor to God, the Father the Son and the Holy Spirit, for placing you in path. I also give thanks to you by taking time to put this program together. To me , it is not a buying product, but it is just a ministry , by revealing me the secret to play the piano. I went to school and I gave up because I was frustrated when I had to count 8th notes and 16th notes .The teacher had so many students and had no special time for me and keep repeating lesson. I changed my mind, I went to people who know how to play by hearing, when they played , they were sound good to me , but I was unable to apply their formula not knowing when to change. Now , with your products, and a minimum amount of time , my reading and counting are improved and my music is sound great and classic , because my wife and my friend testified that. I believe by continuing applying your technique , I will become one of your true disciples and compare with what I paid to learn music, your program is a gift. By showing the proper finger to play makes music simple. Miss Yoke , you are my friend because I take you everywhrere, with my Ipad and Iphone. My only problem some of files were damaging while downloading. Just started the sight-reading course from Yoke Wong,less than a week ago, and I'm seeing my problem areas clearly. Knowing the notes on the staff, knowing intervals at a glance is all getting better now.Seeing the piece as a whole,analyzing it, reading down the scale fluently, is nice when Yoke teaches it.From the mirror idea I have been able to cut down the two stave to AC,BD,CE,DF,EG,FA,GB, for same up-to-down lines and spaces. Lastly I liked Yoke teach on seeing chord notes during analysis. 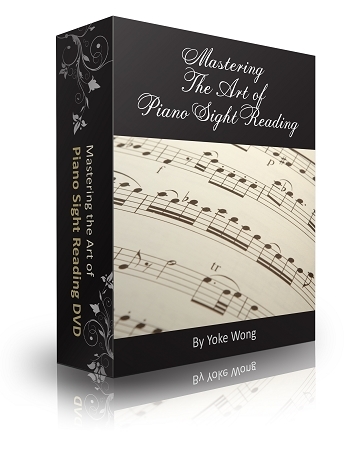 The "Sight Reading Course", has definitely helped me! The videos showed me new methods to help me remember the notes. The games are fun and helpful. Thanks Yoke, you are a wonderful teacher!